1. Coat a large skillet with cooking spray; place over medium-high heat until hot. Add bell pepper, onion, mushrooms and Italian seasoning; saute 4 minutes or until crisp-tender. Remove vegetable mixture from skillet; set aside, and keep warm. 2. Spread margarine evenly over one side of tortilla. Recoat skillet with cooking spray; place over medium heat until hot. Place one tortilla, margarine side down, in skillet; top with 1/3 cup cheese, half of the vegetable mixture, and 6 pepperoni slices. 3. Place 1 tortilla, margarine side up, on top of vegetable mixture; cook 2 minutes or until lightly browned. 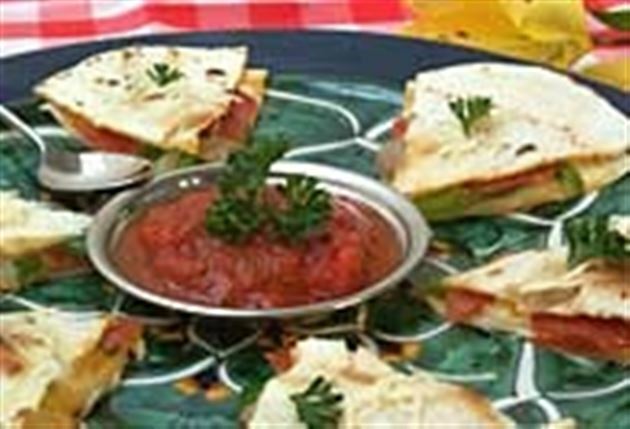 Carefully turn quesadilla with wide spatula; cook an additional 2 minutes or until lightly browned. 4. Repeat procedure with remaining tortilla, cheese, vegetable mixture and pepperoni. Cut into wedges, if desired. Serve with pizza sauce. Enjoy this delicious pizza quesadillas Mexican recipe!